Well, I must say it’s nice not to be disappointed for a change. Having been extremely excited to see director James Wan’s follow up to Insidious, a film I am a huge fan of, The Conjuring has left me extremely impressed, and feeling unusually optimistic about the future of the American horror film. (The horror film is of course currently alive and well in Europe at the moment, especially in Spain and France, and with the return of Hammer it’s not looking too bad for the UK either) After seeing the recent incarnation of the Evil Dead I was beginning to worry that Hollywood was trying to run all of my favourite horror films into the ground, something I will withhold final judgment on until after Carrie is released later this year. All of these great franchises began with an original film; Nightmare on Elm Street (Craven, 1984), The Evil Dead (Raimi, 1981), Halloween (Carpenter, 1978); all great original American films that added something new to American horror cinema. So I am sure you can forgive me for asking where are the new original American horror films represented at the box office today? (after all hundreds of original horrors are produced each year but only the drab big studio remakes usually make it to a wide release) Well, The Conjuring seems to be the ironic answer to that question. 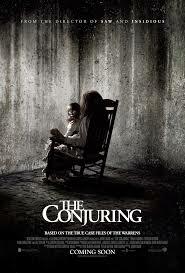 The Conjuring is a ‘true-life’ recounting of the investigations made by married parapsychologists Ed and Lorraine Warren (played by Patrick Wilson and Vera Farmiga) into the strange events that occurred at the Perron family residence at Rhode Island in the 1970s. The film focuses on the history of the Warren’s giving us a look at a couple of their cases, before introducing us to Carolyn and Roger Perron (Lili Taylor and Ron Livingston) and their five daughters as they move into their new home. Strange things happen from day one, but events are initially attributed to the large family being in a strange new house filled with the chaos of moving boxes. The youngest daughter gains an imaginary friend, the next youngest sleepwalks into her sister’s bedroom each night and repetitively bashes her head against a large wardrobe that came with the house. 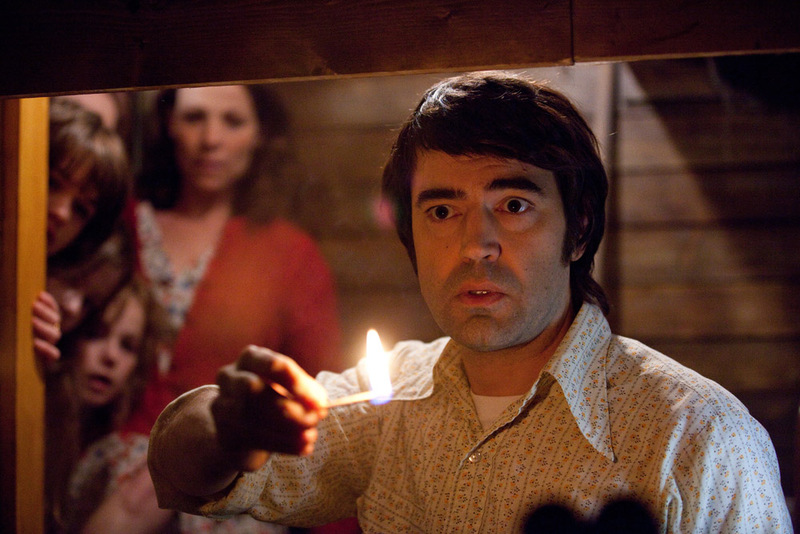 Mr. Perron discovers an additional basement room hidden behind a wood panel and Mrs. Perron, whose sleep is constantly interrupted by someone or something that gives her bruises in the night, is constantly drawn to the basement by a presence that poses as her daughters, making clapping noises to lure her down. At the end of her tether, Mrs. Perron visits a University lecture given by the Warren’s and begs them to help. Mr. Warren is initially reluctant as he is acutely aware of how badly effected Lorraine was by their last case, but Lorraine (a clairvoyant) senses how desperately Mrs. Perron needs help for her family and agrees to take a look. When the Warren’s enter the house Lorraine is left in no doubt that the many spirits residing in the house are extremely dangerous and decides that the house needs an exorcism, but to get help from the Catholic church the Warren’s must provide proof of the events at the house. The remainder of the film revolves around the pursuit of proof, and the dangers faced by both the family and the Warren’s investigative team as they search for it. Wan couples carefully built up set pieces with a skilled direction of his actors, allowing them to give genuine reactions to the event in the scene with less restriction that in many horror’s. 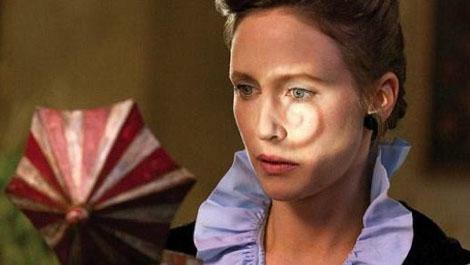 Vera Farmiga is particularly engaging in her portrayal of the emotional pressures heaped on Lorraine Warren caused by her psychic visions. The Conjuring has a very good cast in general, and this is a testament to the trust actors clearly have in James Wan’s ability to bring out sensitive performances in the types of films where characterisation can so easily be forgotten. Wan has also been extremely sensitive to the fact that the majority of the people portrayed in the film are real people alive in the world today. The effect of this careful weaving of truth and fiction is impressive; towards the end of the showing of the film that I watched a woman jumped up during one of the key climactic confrontations between good and evil, grabbed the bloke next to her, and dragged him (unamused) out of the screen never to return. This is the first time during any horror film I have watched that I have actually seen someone leave the cinema unable to deal with the psychological implications of what they are seeing on the screen. Would the same thing have happened had the film not told us that it was based on a true story, probably not? For a similar event in horror film history we would have to look back as far as William Friedkin’s The Excorcist (1973), William Peter Blatty’s screenplay and book were loosely based on true events, and the film was effective because a huge percentage of audiences believed in a lot of the themes the film played on (the fight between God and the Devil for the souls of man) Reaction to the film in screenings included fainting and vomiting. The Exorcist was banned on video in the U.K. until 1999. There was a rumour going around our school at the time that if you watched it, the film had the power to make you commit suicide. We promptly got hold of a copy, watched it, and were somewhat disappointed, The Exorcist is a complex film, based around ideas and ideologies (not just horror) that at 15 years of ages we were too young to fully grasp. It took repeat viewings to understand the true power of that film. Living in what is now a mostly agnostic country it is hard to see that a film like The Exorcist would have quite the same impact today.